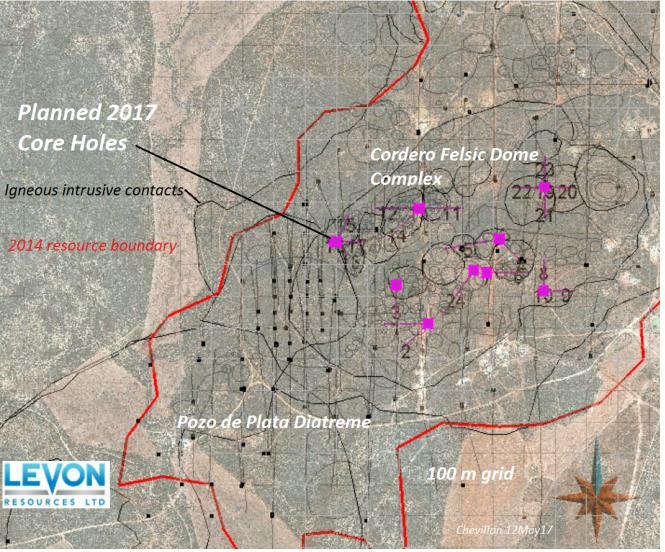 Levon Resources Ltd. is pleased to announce the startup of the 5,000 m core drilling campaign at the Cordero Ag, Zn, Pb, Au discovery, 35 km north of Hildalgo Del Parral, Chihuahua, Mexico, previously announced by the Company on April 4, 2017. 200 m core holes are planned to infill drill a central part of the 2014 resource, (news release of October 20, 2014) to explore for improved near surface resource grades. The holes are being drilled in the Cordero Felsic Dome Complex (central) portion of the resource that spans four host igneous intrusive centers (Figure 1). If the drilling is successful, results can improve the projected economics of a starter open pit being evaluated by Independent Mining Consultants (IMC), Tucson, Arizona.